It seems that there is another new mining pool foe Ethereum’s Ether (ETH) coins that has just launched. The new pool is called Weipool and offers a simple web-based user interface for mining Ether coins with the help of ethminer, you can use our Quick Guide on How to Mine Ethereum on Windows, if you are still new to Ethereum. The new pool does not yet have a lot of miners and it is supposed to do payouts every 12 hours if your balance is more than 1 Ether, with 0.01 Ether tx fee and currently 0% pool fee for the first week (1.5% fee after that). Since it is a new pool it may take a while for miners to gather and for the first blocks to get solved, so be careful and do have in mind what happened with Pooleum – a new Ethereum pool that seems to have completely disappeared now. The Weipool does have user controllable hashrate (difficulty) setting, so it should be suitable for miners with lower hashrate. 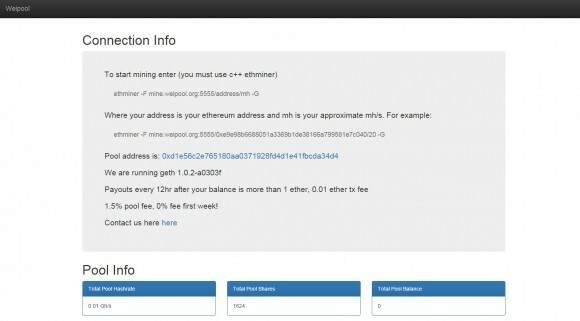 The above command line is an example you can use to get started mining with ethminer at Weipool, you just need to replace the wallet address with your own Ethereum wallet and the default hashrate value of 20 (suitable for a single high-end GPU such as Radeon 280X) to the respective hashrate of your mining rig and you are ready to go. The above line is for mining using the OpenCL version of ethminer, for using the CUDA fork you need to replace the parameter -G with -U and you should be ready to go.